The articles in the March/April 2012 issue complement the Safety Standdown’s three central themes: Loss of Control, Aeronautical Decision-making, and Advanced Preflight. Articles on each of these critical areas provide important insight, tips and resources for improving general aviation safety. Other articles include an overview of this year’s FAA Safety Forums at Sun ‘n Fun (pg. 4), a review of how allergy medications may impact your flying (pg. 7), and a look at “smart” autopilots for general aviation use (pg. 14). Sept. 14th the Petaluma Area Pilots Association had a very informative speaker at their monthly meeting. The AME (aviation medical examiner) gave a good description of his side of the equation on obtaining and keeping our medicals. The subject is especially germain since none of us are getting any younger and loosing one’s medical must be a very sad event. Basically the doc can pass, suspend or defer our medicals when health issues or medications get in the way of what the FAA will accept. The very best place to look up medications and or health issues is on the AOPA web site. They define what meds can fly and which can’t. If something comes up (like a cataract) and you do not pass your medical your medical will be suspended. After surgery you will need a letter from your eye doctor stating what your new vision is and that you are able to go back to flying. You must obtain these papers. The papers will be sent to Oklahoma where they will give the seal of approval. If something comes up between medicals and you voluntarily suspend your flying, get treat- ment/cure, you still must obtain papers from your medical provider stating what happened, how it was treated and that you are safe to fly. Take these papers to your AME to back up any questions. AGAIN- if something comes up, check the AOPA web site for medication questions. You can go back to your medical provider and insist on a different (acceptable) med to keep you airborne. IF the unfortunate happens you can still fly ‘light sport aircraft’ as long as you don’t fail a medical. (meaning you never go back to fail a medical) ‘Light sport’ aviating only requires a drivers license. But in saying that it is all our responsibility fly safely. Options are having another pilot fly as ‘pic’ with you or flying with an instructor. The very best option, of course, is staying healthy! Watch out for long flights, do some isometrics or stretch! Pulmonary edema is so common in long cross country flights. Usually the AOPA magazine migrates to my side of the bed where it languishes in the dust until recycling day. Lately I’ve had time to peruse the glossy and one item in particular caught my attention. ‘Math Myths’ by Bruce Landsberg, president of AOPA Foundation has great, basic, numbers we can retain. Math was always my weakest arena and his words resonate. I’ve cut and stitched so if you’d like to read the entire article it’s in the January 2011 AOPA, page 30. These winter months are a great time to dust off the POH and tweak the memory banks. There is a myth among many in aviation and education that advanced math is essential to fly with any degree of safety and skill. Unfortunately my father did not pass along his genetic gift for advanced mathematics, but that was little detriment to my becoming a pilot. With the basics of addition, subtraction, multiplication and division, safe flight operation is well within the grasp of math illiterates. Pilots do need basic math for practical estimates and to read charts and graphs – all within the capability of liberal arts majors. When should we begin descent from cruise flight? In a piston-engine aircraft where cooling is a consideration, use five miles per thousand feet. To descend 7,000 feet to the airport, start down about 35 miles out. Taking the Naval Aviators percentage, if the landing distance based on the POH (the best the manufacturer’s test pilot can do on a good day with a new aircraft) is 2,000 feet over a 50-foot obstacle and you’re having a bad day by being a bit fast, 2,400 feet is the approximation. From an operational perspective, the Air Safety Institute recommends adding 50 percent to the POH number, so that works out to 3,000 feet. It provides some margin for runway slope, some clearance over a taller obstacle and less than perfect technique. Climb gradient per nautical mile is required for many departures. The standard gradient is 200 feet per nautical mile. If the ground speed is 120knots, that’s two nautical miles per minute. Two hundred times two means 400 fpm is needed to comply with the gradient. Tailwind? Be a bit more conservative. Headwind? Fat city! For pilots it’s important to know that with 24 gallons of fuel on board and a fuel burn of eight gallons an hour, about 3 hours after takeoff a collision is a distinct possibility. There are still about two fuel mismanagement accidents weekly, so the basic math bone isn’t working for some pilots- or maybe it has nothing to do with math at all. Basic math used in conjunction with conceptual understanding will keep one alive much longer than computational algebra. 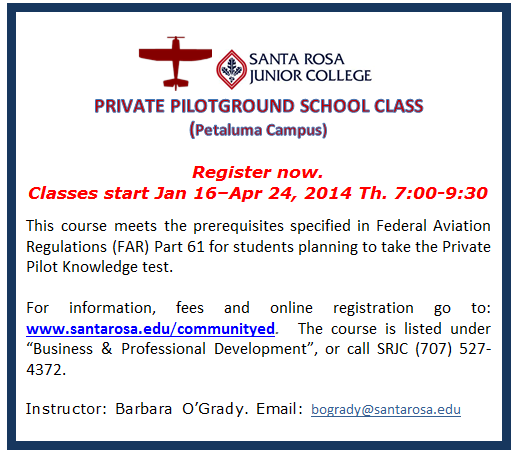 As we rebuild the pilot population there’s no need to throw up a high math barrier to aspiring pilots. You all have seen those red sleeves that snug over the pitot tube. I never thought a bug or piece of grit would want to call that tube home. Au contraire! After 20 years a mud dauber wasp filed homestead papers on 89P’s pitot tube. The Comanche had been sitting outside for 6 weeks. The way the morning light was in my eyes during pre-flight, I never saw the muddy cap over the orifice. After pushing the throttle forward for take off, noting a lack of airspeed indication, I still rotated. The plane flies great. Just another good reason to know your power settings. Next time, when the plane sits out on the ramp the sleeve goes on. Acronyms are helpful aids to reminding us of a list of requirements or actions. Here are a few. If you have a great acronym, please send it along and we will add it to the list. The following article was sent to me by Mark Henderson, son of Cathy Morshead, (99 extraordinaire). There’s lots to learn! Thanks Mark! A story of how a common mistake can make for a hair-raising solo flight. A first solo is exhilarating in itself, but it can get down right scary when you lose a major system on the plane at 400 feet after take off. This happened to me, or at least I though it did, because of a very simple mistake that was not covered in my pre-solo discussions. As I left the ground on my solo flight there was an incredibly loud static sound in the headset and it seemed I had lost my radios, or something worse. When you have hundreds of flight hours a surprise like that may not merit a panic. But when you’re on you fist solo, a distraction on that level can be downright freaky. Let me explain. It was a sunny day in August 2010. My instructor, Caroline Patterson at Aero-club Marin was getting me accustomed to flying in a Piper Dakota (PA-28-236) which was formally owned by my mother, Catherine Morshead (a 99). You see I purchased the Dakota from my mother after she lost her medical. It was a way to keep the plane in the family and to still fly together as we used to do, this time with me in the left seat. So Caroline was teaching me the ins- and outs of the Dakota, which was a bit more complicated than the Cessna 172 that we started training in. That day Caroline called me on my way to the lesson, which was at an airport in Marin County and gave me the news. I was to pre-flight the plane and fly just a few miles to a neighboring airport, Gnoss field (KDVO) and meet her for the lesson. This constituted the first solo in the Dakota (I had soloed the C172 around the pattern at KDVO previously). I felt the butterflies in the stomach but told Caroline that I am up for it and I would see her at the destination airport shortly. The pre-flight was standard. The winds were about 8 kns left to right on the departing runway. The radios were pre-programmed by me for the departing airport frequency and the destination airport frequency. I even picked an alternate airport on the chart if the winds were too strong at Gnoss. The run up was fine, I looked over everything once again, grabbed a sip of water of my water bottle that was in the back seat, took a deep breath and made the radio call that I was departing. As I gave it full power the realization that I am solo the Dakota set in. The instruments seemed to be a little brighter. “Were there this many instrument dials before”, I thought. Everything was just a bit more intense; hell, I’m soloing!! When the wheels left the ground I was happy, or better said, I was thrilled. But at 400 feet everything changed. I suddenly heard a loud static sound in the head set. It sounded as if the door was open, or broke off. I checked that the door and window were shut which they were. Now I was at 500 feet and I thought it could be an electrical problem. It sounded like what would happen to your TV if someone ripped the plug out of the wall. I looked at the instruments and they seemed fine. Now I was at 600 feet. I took off the head set to see if the sound was only in the radio. All I could hear was engine noise, which was normal, but loud. I put my headset back on and I was at 700 feet. The foreign sound persisted and was loud. It cannot be good. My thoughts began to race in all directions. What if there is some thing wrong with the plane? If I need to turn around I’ll have no radio to make calls, I could collide with someone. I sure don’t want go to the destination airport with no radio. Remember it was my solo, my nerves were already rattled enough doing normal procedures. Suddenly a voice inside my head cleared my thoughts. I remembered Caroline instructing me over and over if something goes wrong, the first thing you do is “fly the airplane”. Don’t panic and drift into uncoordinated and dangerous fight attitudes as you rummage around the cockpit trying to fix something. One should first accept that something is not going right, then make your first priority flying the airplane. With this guiding voice in my head I blocked out the horribly strange noise and made sure to level the wings, brought the pitch to Vy and climbed straight out to 1500 feet. I leveled the nose, reduced power to cruise, trimmed, and then took another sip of my water bottle. I tried to block out the fact that I was doing this in my solo. “Everybody’s solos are like this” I thought; gulp. OK, now lets figure out the strange noise problem. My first move was to call a radio check. Nothing. My next move was to find another headset. There was one plugged into the right seat where Caroline sat during our training. I reached down to grab it off the ground and put it on my head. Then I made another call for radio check. But the yoke talk button seemed dead. (I found out later that the talk buttons only work on same side it’s plugged into). I took that head set off and placed it on the seat to my right. I put back my original headset and the awful sound was gone. The headset was quiet and functioned normally. I made a radio check call and I received a response, “check loud and clear”. A huge rush of relief came over me. I double-checked everything and it all was normal. “Could I be saved?” I hoped. Of course I was suspicious that the problem would return. At this point I was halfway between airports so I headed to Gnoss, the destination airport, switched radio frequencies, and listened to AWOS. It reported light crosswinds, which to me was good news because at least the radio worked to inform me of that. I entered the pattern, landed a bit long and taxied to Caroline who was waiting on the field. “Well, how was it?” she asked. I told her the story and she reviewed with me some possible reasons for the problem. “Maybe somebody had their radio on, that can happen. Maybe the headset ran out of batteries, or the plug is faulty” She suggested. “Well, that’ll do it,” she said, “once you got up to speed the vents blew air on the extra head set microphone and forced the talking microphone to stay open. This caused a loud wind sound to persist in the left head headset until you picked it up”. You see, once I reached over to try on the right-seat headset I retrieved it from the floor. Then I placed it back on the seat, away from the vent. By doing this move I unknowingly solved the problem. This simple problem could happen to anyone when you think about it. We train with two people in the front seats. Both headsets are used. When the instructor gets out for a solo, it is likely for the right seat headset will still be plugged in. If it happens to be next to an open vent, then you can create a very scary flight environment. As, in my case, the already nervous first time pilot-in-command who cannot talk or hear anything on his solo. In writing this little story I hope that it can help others avoid this problem. But of more importance, if you do encounter a problem that you remember the classic first move for all pilots; “fly the airplane” above all else.